Dec03 Comments Off on Where does bacon-scented underwear fall into our holiday gift guide? Where does bacon-scented underwear fall into our holiday gift guide? The holiday season is here filled with seasonal drinks, pastries and lights. We are finally able to listen to Christmas music without being judged and can pull out that ugly sweater from the ‘80s. With this season, however, comes gifting. We are participating in Secret Santa groups and trying to find the perfect gifts for those special people in our lives. When searching for the perfect gift, there are some interesting options out there. One of the more out there options are J&D’s bacon-scented underwear. J&D is a food company, specializing in meats, namely bacon. I am just trying to wrap my mind around this underwear. Not only are they super tight, but they’re also scented. I repeat, they are scented. They smell like bacon. Your downstairs can now smell like bacon. Like what? What is this saying about our society and what we are choosing to spend our money on? I may be looking too deep into this, but I could not help but feel intrigued by this concept. Americans love food. We have an American holiday completely based around it. We are obsessed with it. We watch food videos constantly. We have food blogs and one of the most obese populations in the world. It’s consuming our lives. Of course I love food, but I also do not think food is all we should think about. Yes, we need it to live but I also think it has reached a point, especially with this underwear. Even more, the same company has a bacon-scented pillow. I do not know about you, but I feel like the entire concept about making your food related household items scented is just weird. Why would you want to smell something all the time? I am all about variety and I am all about moderation, but that is just what I think. But the bacon-scented britches are not alone — there is other food-scented apparel out there. 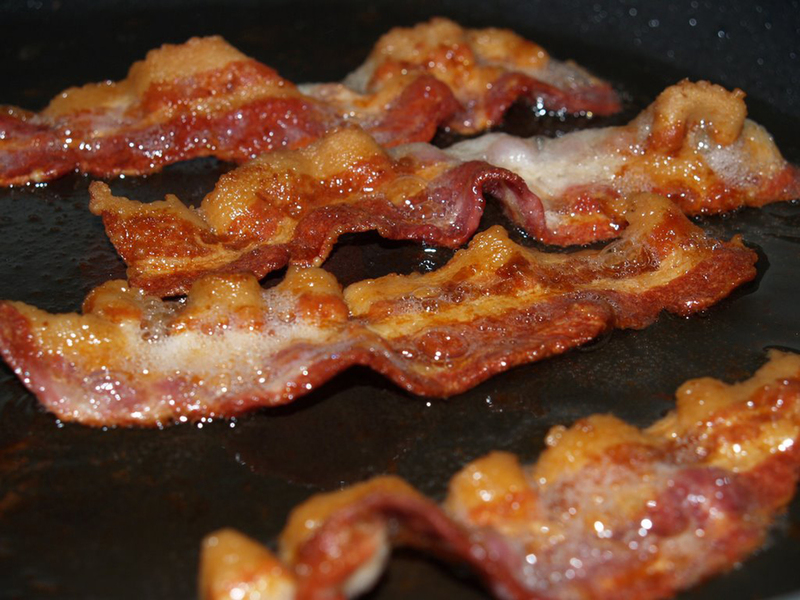 And what food do Americans love just as much as bacon? Pizza. SkyMall has a pizza-scented t-shirt, with scents lasting up to 20 washes. The description of the shirt even mentions that the scent can be smelled from six feet away. WHAT? I get it that you love food and you love smelling your food but you do not need to subject the people around you to your smell. And you would just be hungry all the time, yes? I do not understand. I get that we are obsessed with food as a culture, but I think it is time we try to focus on other avenues, such as the global warming crisis or Syrian refugees. Or maybe buy our relatives things that are useful and meaningful to them, like normal clothing or jewelry. I am not saying items like this aren’t fun and exciting, I just feel like making items like this scented has reached a new level that I do not feel comfortable with. But hey — it is funny. It’s entertaining. It is a silly thing to have to show your houseguests or your special someone. The holidays are about making people happy and showing them that you care about them through gifts and love. And if buying someone a pair of bacon-scented underwear is something they would appreciate, I do not see any reason why you should not. I just think that our obsession with food has reached a completely new level. I cannot wait to see what else companies will come up with for those food-obsessed individuals. ← Are Trump supporters unwilling to face the lies?